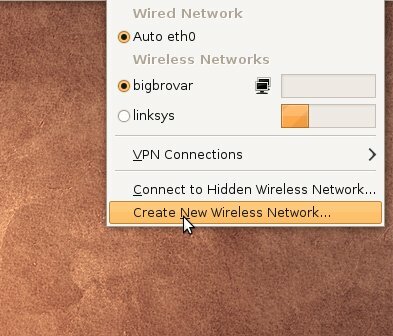 I wrote a guide earlier on how to share your internet connection on ubuntu. But the guide was for non wireless sharing . well here is an updated version that allows you to share your internet connection wirelessly to other wireless devices in your home by showing you how to create a ad-hoc wireless network on your laptop . you should now see a message that says “Now you are connected to xxxx wireless Network”. well that is all. Now when you search for a wifi connection on your wifi device you would see the one you just created connect to it and happy surfing. Note: This will only work if the sharing system is not using wireless as its means of connection. if it is then the older guide would work for you. Note: for some reasons i couldnt connect to the ad hoc wireless created using this guide wicd on my laptop (which uses mint-xfce) but i could connect and browse with my nokia N810 without a problem. so it must be an issue with wicd which i would find out more on. Edit I can conforim that this guide works with Hardy Heron. But the network manager 0.7 has to be installed. to do this is quite easy. once this is done reboot and you should have a new shinny network manager 0.7 plus all the goodies that comes with it. Hey Buddy!, I found this information for you: "Share You Internet wirelessly on Ubuntu". Here is the website link: http://bigbrovar.aoizora.org/2009/01/17/share-you-internet-wirelessly-on-ubuntu/. Thank you.